Perhaps America’s best known thinker, Ralph Waldo Emerson led a renaissance in American ideas in the 19th Century: a search to realize the high potential of the individual person, to understand the proper role of the individual in society, and to discover and celebrate the interrelation and sacredness of all life. He was a pragmatist and an idealist, a lecturer, a prolific writer and a poet. In July 1835 Ralph Waldo Emerson purchased his Concord home, proclaiming it was “the only good cellar that had been built in Concord.” Along with the house, there was a sizable barn, on two acres of land. In addition to housing various animals, the barn was used for over a year as a schoolroom for Miss Foord’s school. The Emerson children attended the school along with Lizzy and Abby Alcott, Lizzy and Barry Goodwin and Caroline Pratt, all from Concord. The house Emerson brought his bride Lidian to on September 15, 1835 became that "sylvan" home where they would live together for the next forty-seven years. The Emersons had four children. Their home became not only a place for Emerson's study and writing, but a literary center for the emerging American Transcendentalist movement. In the early years the Emersons referred to their home as Coolidge Castle, a reference to the Boston Coolidges, who had it built as a summer house. In the family the house became known as Bush, and it remained Emerson's "home front" for the rest of his life. When I bought my house, the first thing I did was plant trees. In November 1836, after the birth of his son Waldo, Emerson planted six hemlocks. In 1837 he planted thirty-one pine and chestnut trees. The chestnuts fronted the house, the last one coming down in a storm in 2012. In 1838 he wrote to Thomas Carlyle, "I set out on the west side of my house forty young pine trees." Soon the two acres grew to nine and in 1847 Emerson had enough land to plant 128 apple, pear and plum trees. The house contains Emerson’s original furniture and objects, much as he left it. The Ralph Waldo Emerson Memorial Association (RWEMA), formed in 1930 by family members and others associated with Emerson’s library and work, owns the Emerson House and the Emerson family papers, and is responsible for maintaining the house and for promoting interest in Emerson’s literary works. The RWEMA is a private non-profit 501(c)(3) corporation. Has Charles told you that I have dodged the doom of building & have bought the Coolidge house in Concord with the expectation of entering it next September. It is a mean place & cannot be fine until trees & flowers give it a character of its own. But we shall crowd so many books & papers & if possible, wise friends, into it that it shall have as much wit as it can carry. Emerson’s study held his most precious items, including his books and many other objects that reflected his interests and amused his young children. 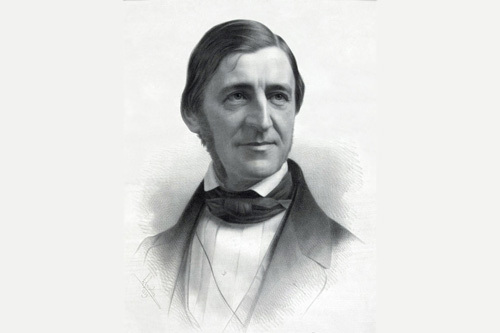 Learn more about this remarkable man, and his impact on the world, by visiting his home, which features Emerson’s original furnishings, books, art and other objects. We open on April 25! I gladly pay the rent of my house because I therewith get the horizon and the woods which I pay no rent for. For daybreak and evening and night, I pay no tax. I think it is a glorious bargain which I drive with the town.